Dec 2015 – The Nebulophone has been on my wishlist for a while, so when Makershed held their holiday sales, it was great to pick one of these for an even better price. Even without a discount, this is a worth while piece of gear and makes some great sounds. Build took about 1.5 hours, going at a steady pace with no interruptions. The online instructions were great. This was also the first project that I did with a new circuit board holder, which replaced my former method of using a desk vice. This was SOOO much better. I had read on the Makershed reviews that there was a “gotcha” somewhere in the capacitor placement, but my board was very clearly marked and I had no issues. The Nebulophone worked the very first time I powered it up. 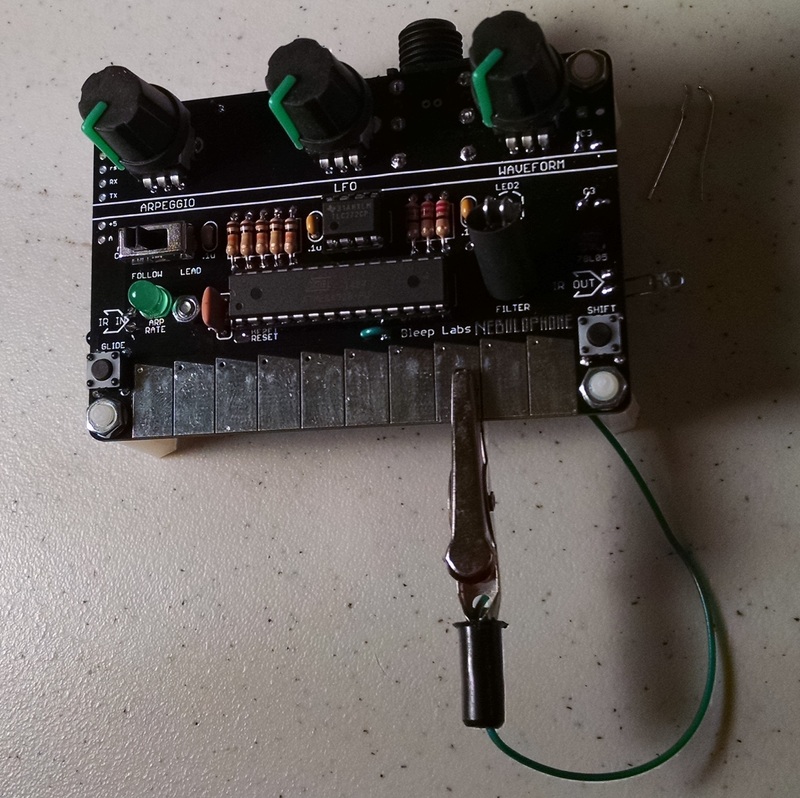 The 1/4″ jack acts as a switch, which is a really nice feature that more projects should have. I think it makes it less likely that I will leave it on and drain the battery. How does it sound? Great! Check out some of the experiments below via Flickr and Soundcloud. I have not ventured into changing the stock program, and would still need to add an FTDI header to tap into that option, but even the stock sketch gets you some great sounds. My first experiment involved just recorded a few minutes of random dial tweaking. I then took that file and, using the Simpler device in Ableton, created a number of instrument tracks based on different sections of the original sample session. The ended with about 16 or so separate sounds that I played to create the piece you hear. Aside from a little bit of delay and reverb, those sounds remained unprocessed. These sorts of synth units often benefit from reverb and delay, so the second experiment involved running the Nebulophone directly through my EHX Memory Man – my go-to delay unit. From there I created a number of textures and short pieces to demonstrate the variety of tons and rhythms you can get with a delay. The Nebulophone is one of the more musical devices I’ve built lately, and I see it fitting into my electronic music rig very nicely. Another untapped feature is the IR control, which allows you to with other Andromeda Space Rocker and some Gieske devices. I don’t have any of those, so this feature won’t be useful… yet. Light controlled analog low-pass filter with five adjustable LFO LED modes. Six arpeggio modes with adjustable rate. Portamento with three speed settings. Infrared control of arp rate with other Andromeda Space Rocker and some Gieske devices. Five new waveforms (eight total) including two with dual, detuned oscillators. Programmable sequencer to easily make your own arpeggios right on the Nebulophone. Perfect tuning across six octaves.